Each door has a lock tab on the top of the door. Push in the tab to lock the door, and pull it out to unlock. To lock the passenger’s door when getting out of the vehicle, push in the lock tab and close the door. 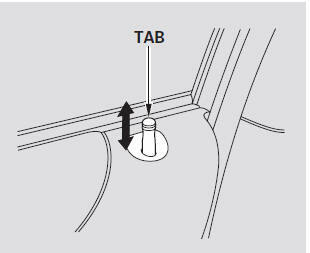 To lock the driver’s door, pull and hold the outside door handle, then push in the lock tab. Release the handle, then close the door. Each front door can be locked or unlocked with the ignition key. 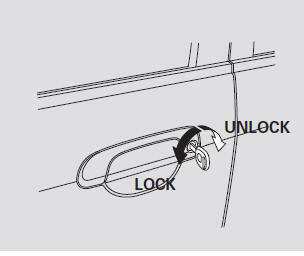 To lock the doors and the tailgate, push the top of the master door lock switch on the driver’s door, push in the lock tab on the driver’s door, or use the key in the outside door lock on the driver’s door. Pushing the bottom of the master door lock switch unlocks all doors and the tailgate. The lock tab on each passenger’s door locks and unlocks only that door. Pulling up the driver’s lock tab only unlocks the driver’s door. To unlock only the driver’s door from the outside, turn the key and release it. If you turn it again, the remaining doors and the tailgate unlock. To lock a passenger’s door when getting out of the vehicle, push in the lock tab and close the door. To lock the driver’s door, remove key from ignition switch and push in the lock tab or push the top of the master door lock switch, then close the door. 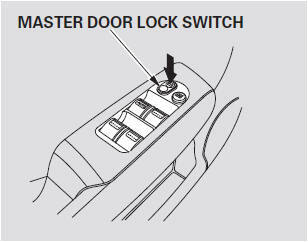 With the driver’s door open and the key in the ignition switch, the master door lock switch is disabled. It is not disabled if the driver’s door is closed. If you try to lock the open driver’s door with the key in the ignition switch by pushing in the lock tab, the tabs on all doors pop up when you close the door. The childproof door locks are designed to prevent children seated in the rear from accidentally opening the rear doors. Each rear door has a lock lever near the edge. 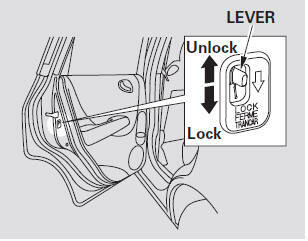 With the lever in the LOCK position, the door cannot be opened from inside regardless of the position of the lock tab. To open the door, pull the lock tab up, and use the outside door handle.